I made this to kind of get away from all the trouble with that 1930's dress. 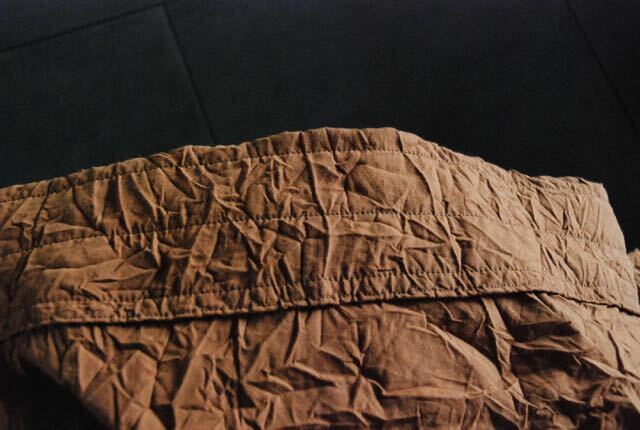 I bought three meters of this wrinkled cotton blend recently. I loved the colour and hopes the wrinkle effect would wash out (in which case I would probably have bought more). It didn't wash out so that rather limited my options. The one I went for was very simple: A simple but big gathered skirt (my apologies for the quality of the pictures, I was back to using the self-timer again). There are three full widths of 140 cm wide fabric in there. 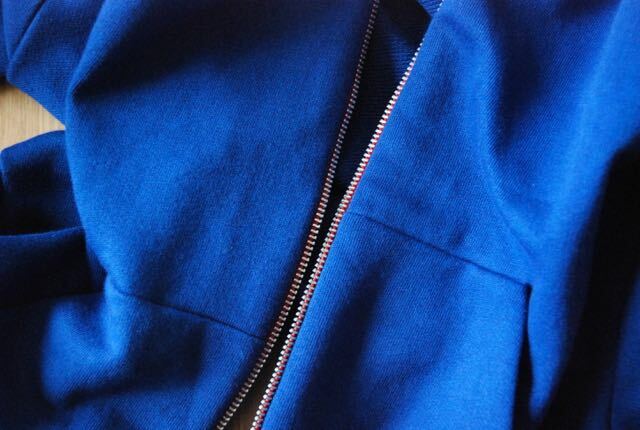 And I put in-seam pockets at the side/front seams. 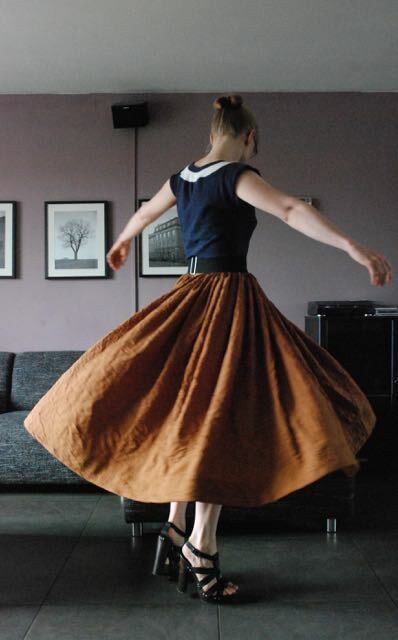 Of course if would look quite impressive over a big petticoat but I like to be able to wear even full skirts on their own as well. 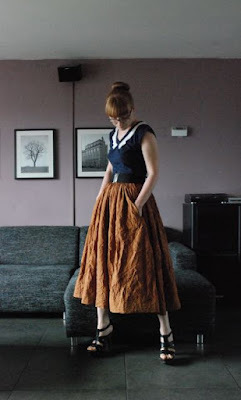 With gathered skirts, that often makes me worry about having the hemline kind of curve in past the hips. 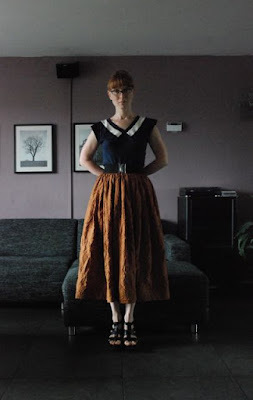 In this case, I tried something new to deal with that:I sewed an 8 cm strip of thick-ish flannel to the hem allowance and then hemmed the skirt using the sewing machine's blind hem stitch. When wearing the skirt, the effect is subtle, but it is certainly there. And then, I obviously needed a nice top to go with the skirt... 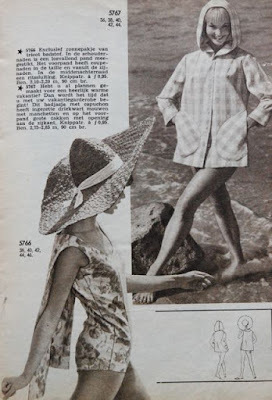 It's a very simple tried-and-tested shape with cut-on cap sleeves. I just gave it a new touch by inserting a strip of contrasting fabric under the neck band. At first, I wanted to make it like a kind of second neckband but at the last moment, I decided to keep the center front in the dark blue. 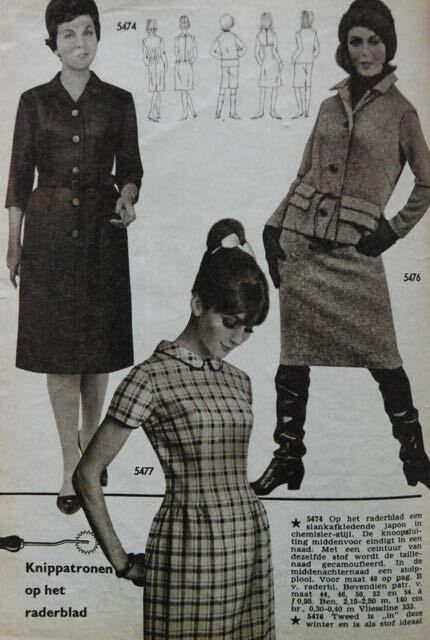 I like the effect, like a stylized collar. This weekend, I should really go ahead and unpick the side seams on that 1930's dress but I am really glad I made this outfit. It's a lot of fun to wear. This is the finished article! 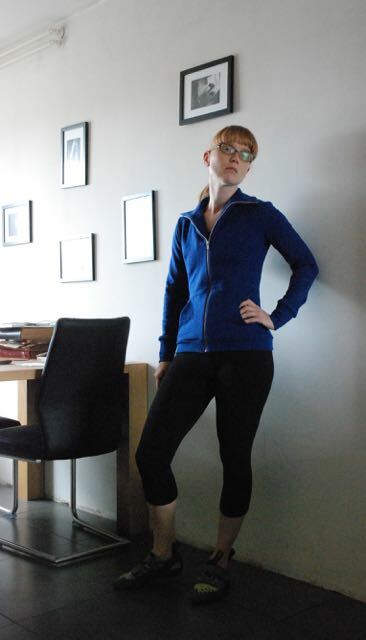 I drafted it based on my normal knit sloper (not a negative ease one). I think it really looks the part. P.S. 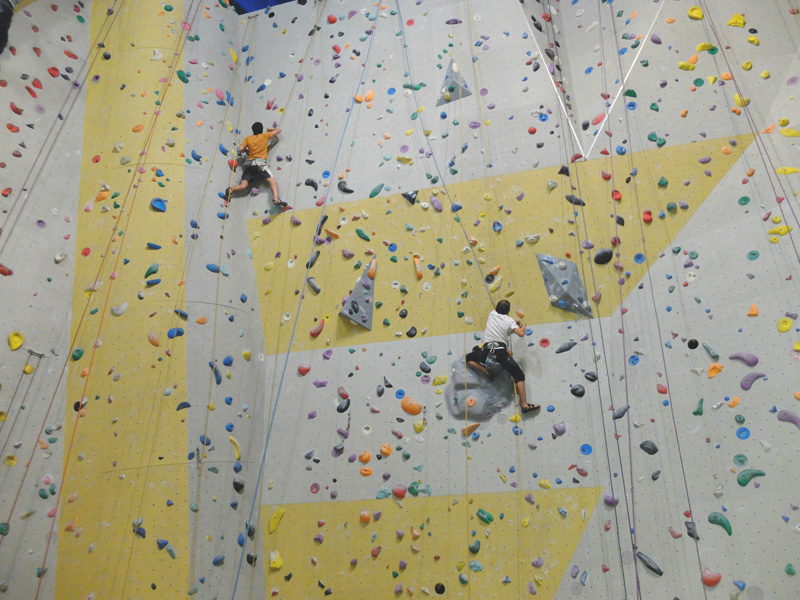 If the climbing hall in yesterday's pictures looked impressive, bear in mind what I wrote about there being no real rocks to climb in this country. Here, climbing halls are not just a bad weather refuge and a place to get started if you're a real novice. They are the places where most enthousiasts do most of their climbing so they have to be high and elaborate to accommodate that. 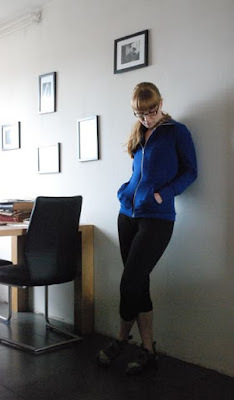 You may have noticed, based on what appears on this blog, but I don't have a particularly sporty style. I am convinced that there is only sporty clothes one circumstance under which to wear sports clothes: When practicing sports. And I will allow for traveling to and from the venue where that is done and even for the running of necessary errands on the same trip, but that's it. I've been rock climbing occasionally for years but since about April of this year, E and I are seriously trying to get better at it. Because the Netherlands are an almost completely flat country without any rocks to speak of, all climbing here tends to be on man-made structures. (The closest real rocks to climb are in the next country, in the Ardennes in Belgium. We've been there once but we are still training to build up the skills to climb outside, on our own). 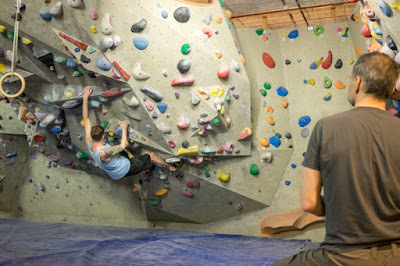 I'm now climbing or bouldering (which is climbing short routes for which you don't need a safety rope. second picture) two or three times a week. So I need sports clothes. I have more or less enough clothes to climb in (although I may try and make a couple of tops) but I need a cardigan/sweater thing. To put on on my way home on colder summer days or, when the weather really cools down again, to wear at the climbing hall (some climbing halls are unheated) when I'm not climbing (when climbing, you alternate between climbing and belaying. You obviously have to pay attention when you are the person on the ground holding the safety rope but it's not really hard work so you can cool down quite a bit). So, that's what I'm making now. Ok, that 1930's dress project is now officially driving me crazy. You know I thought from the start that styles from this decade might not work for me. And my choice of fabric proved tricky from the very start. What I haven't told you yet is that it continued to cause problems. 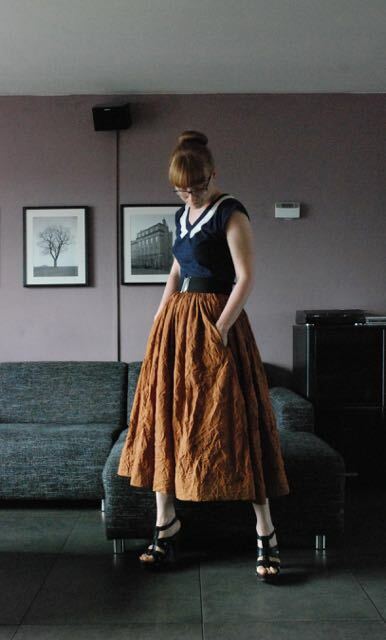 I sewed those long skirt seams in the same way in which I've sewn other bias cut garments in the past, only to find that they pulled horribly. In the end, I had to unpick all of them and re-sew them while stretching the fabric as much as possible... While still trying to match those stripes, of course. 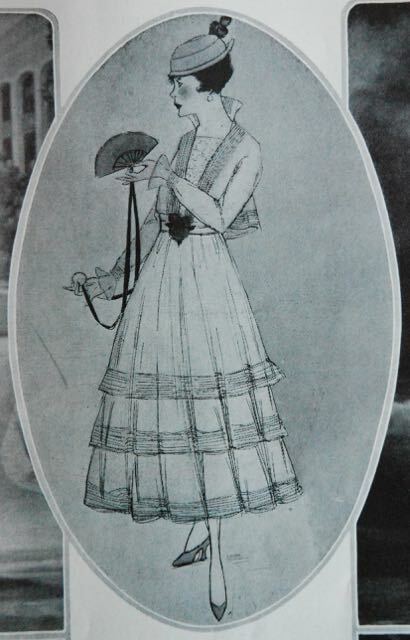 The bodice, with all its angles and made from very soft tule, came with its own set of challenges. After all that, it looked like I had done it. I had sewn everything together, taken it in slightly in the process and now it was flowing smoothly and didn't look bad. I did noticed that the wide flare of the front pieces had stretched out quite a bit on the bias, so hemming would be a bit of a challenge too. So, I let it hang for a bit. 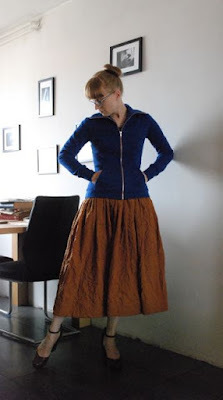 Today, I tried the dress on again so E could pin the hemline. I knew the hem was very uneven. That's not really a surprise with a fabric that stretches a lot on the bias. 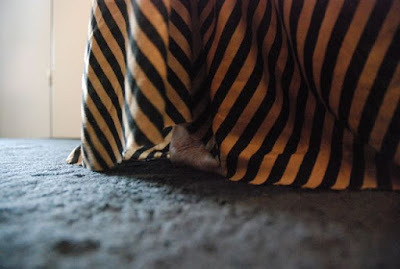 And I don't really worry about the fact that the (un-hemmed) side seams don't even reach the ground. And ankle length dress is fine. What I do really worry about is the state of the seams though. 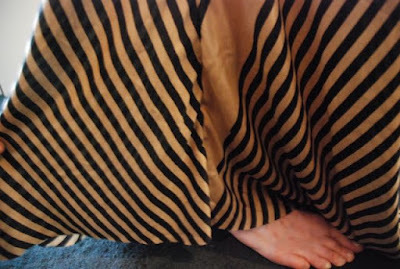 Every bit of skirt seam that hangs freely (as in "is not also pulled at from the side") is pulling again. 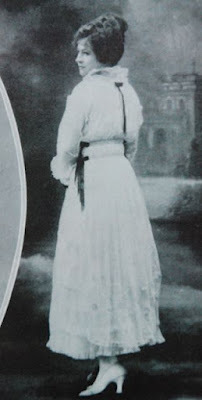 Of course, I could blame myself for letting the dress hang out but I'm sure it would also hang out if I would wear it. The obvious solution seems to be to re-stitch the seams again... I really don't feel like doing that though. 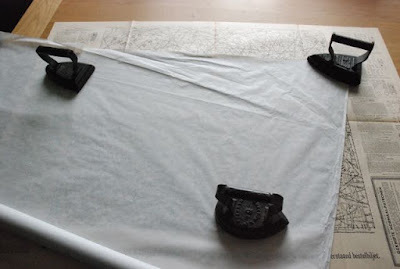 And last time, I already tried to stretch the fabric so how much is doing that again really going to help? Tomorrow, I should be able to finish by 1930's dress. It has been pretty much finished all week but the hemline-to-be had some rather weird length differences as a result of bias hang. So, I left it to hang a bit longer and because it's a full length skirt, I really need help to pin the hemline. So, E can help me on Saturday. 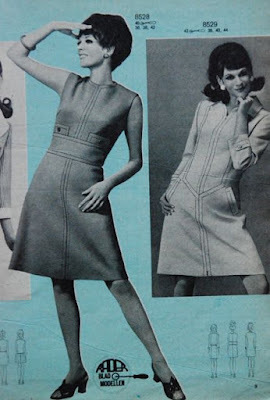 In the mean time, I'm thinking about a next Vintage Sewing Pattern Pledge project. 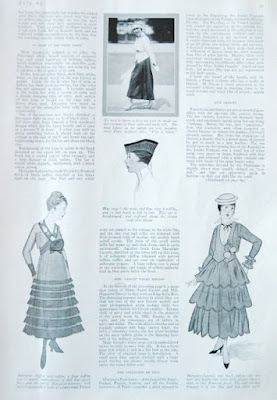 On the warm summer days, of which we've had a few so far, I don't really like to wear my dresses and separates with a closely fitted waistline. Too warm. 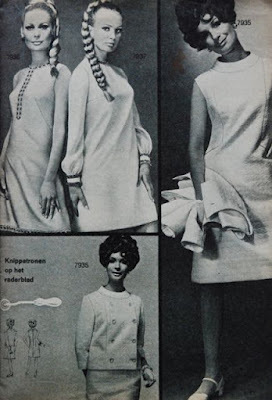 Weather like that suddenly make the short, simple loosely fitted looks of the 1960's seem desirable. I had a look at my vintage patterns. 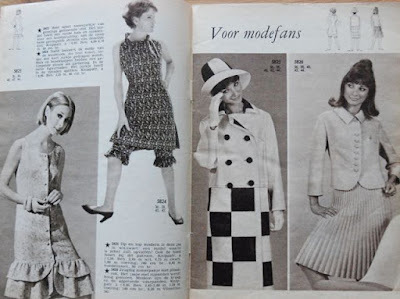 I hvae some 1960's Frohne books but those are from the early years of the decade and include more 1950's-light shapes than the mod looks I was looking for now. The same is true for the two German Gunther magazines but I still have a small stack of post-1950's Dutch Marions. Not a huge amount of them, but they do pretty much span the decade. 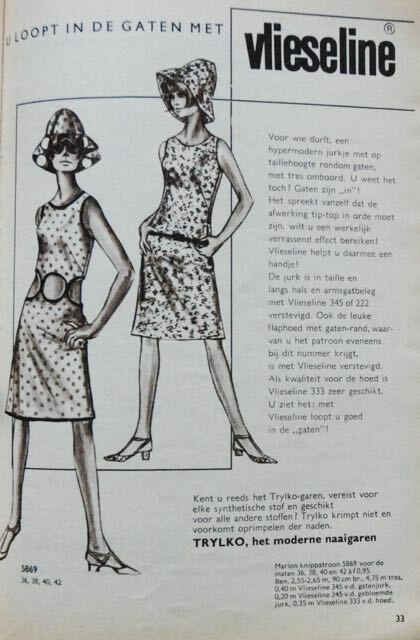 After some examination, I realized that the "typical 1960's" looks I was after doesn't really come in until 1965 (at least, not in mainstream fashion in the Netherlands). 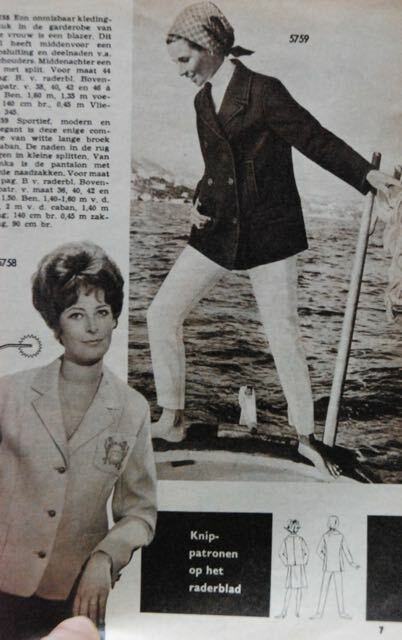 So, the following pictures are all from between 1965 and 1970. 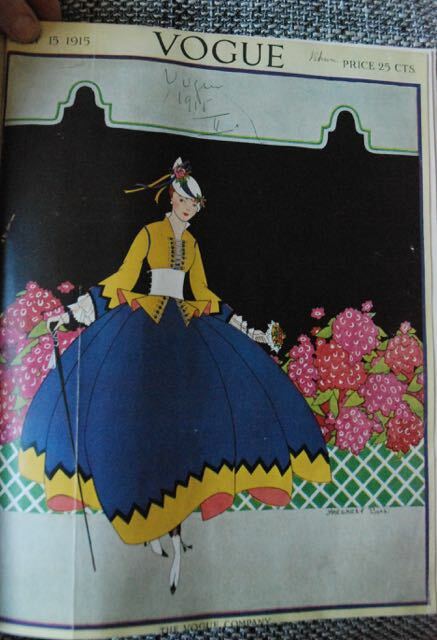 Marion was one of those magazines which included only a few of the designs in each magazine on the pattern sheet (you could get the rest through their mail order service). They must have stopped doing that at some point because my mother subscribed to that magazine around 1990 and it was sort of like Burdastyle magazine and came with patterns for all designs. They didn't until the mid-1970's though. 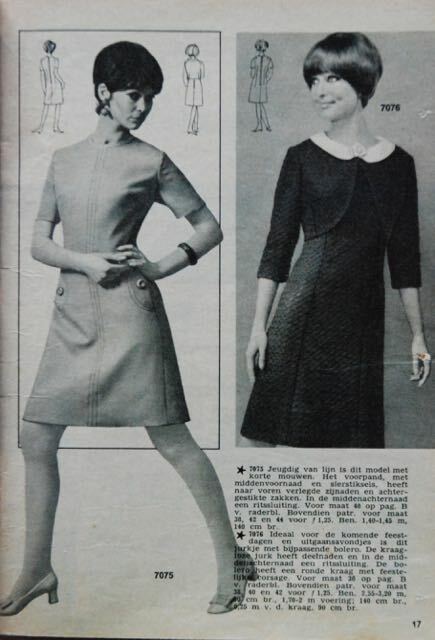 The dress on the left would be an option but the pattern is too large for me, the one on the left would be just a little bit on the small side but it doesn't really appeal to me. and these options are just too winter-y. 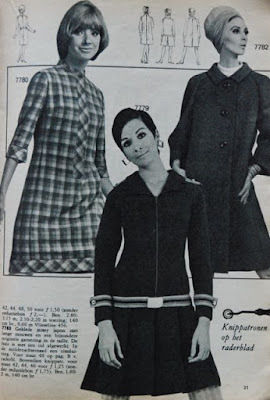 The pattern is for the one on the left. These are prime examples for the craze for topstitching which seems to have returned several times over the decade (and the one after it). And then there are trousers... Such a cool suit. 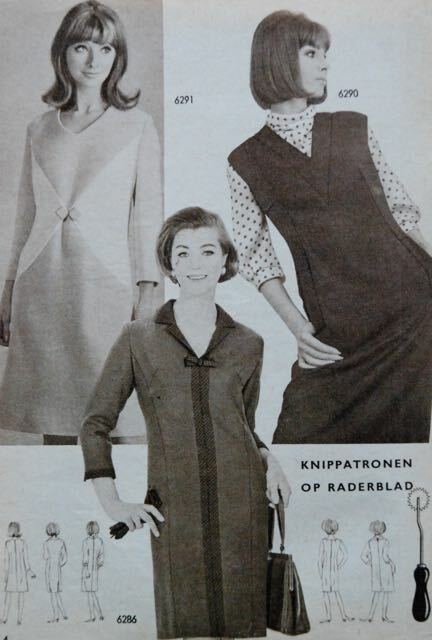 These dresses all look a bit frumpy but I kind of like the diagonal seams and colour blocking at the left. 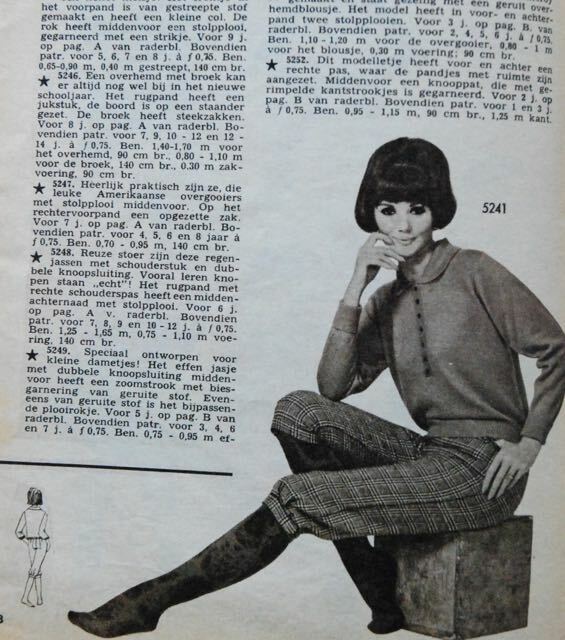 And more trousers. These are sort of like knickerbockers... What do you think: Could I pull off that look? And then, there are these party dresses. I like the one on the left (which comes with a pattern in more or less my size) despite the scary make-up and facial expression of the model. All these are real options but back in the day, you could get some real gems. I thought it would be nice to include a few examples, from the ridiculous to the sublime. A beach suit with a built-in cape! I don't even know what to call the outfits on the left page, the coat has to have a colour blocking design to get that giant checkerboard look and I guess the tame suit on the far right is just lost. 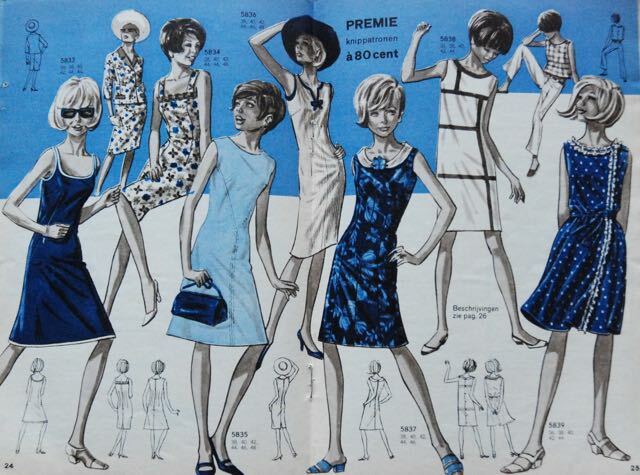 It's a shift dress party! 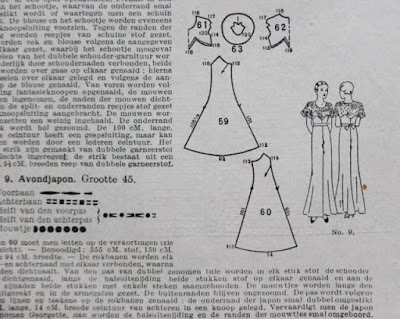 And there is one very pretentious guest: An Yves Saint-Laurent Mondriaan dress knock-off. 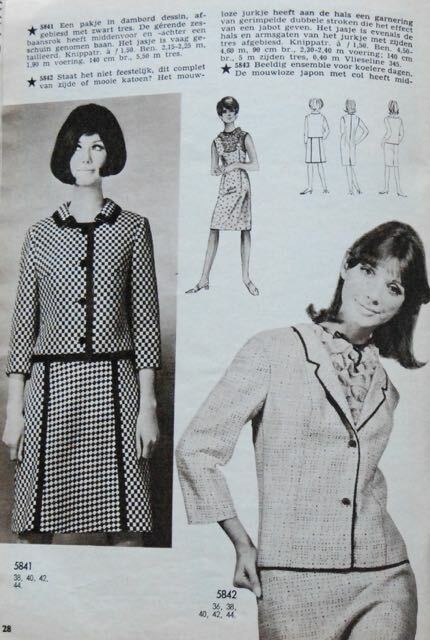 The suit on the right. Yes, it would be a lot less exciting in a plain fabric. But they made it in that block check. I am still finishing other sewing projects but I think I have a favorite already. Do you? 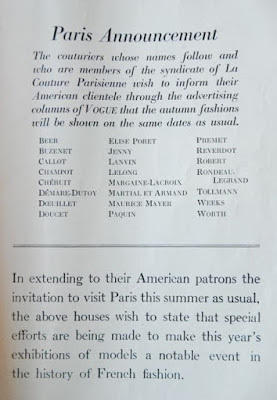 Maybe it would it nice to have a closer look at some of those dresses from Vogue. At these in particular. 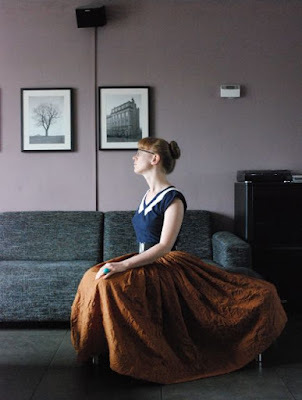 Photographs of actual dresses worn by real women. 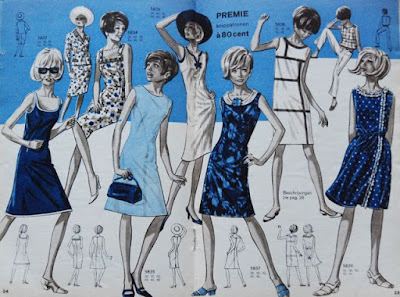 Those ladies are probably models but it still gives a better idea of what these styles actually looks like than all those charming drawings... And these particular designs come with descriptions. A cluster of gay pink roses affords a charming foil to the dull blue of an organdy frock girdled dull blue ribbon, and a rose-toned taffeta hat brimmed with prim little roses carries out the pretty color scheme. To make this becoming frock more becoming a white lace vest is inset. 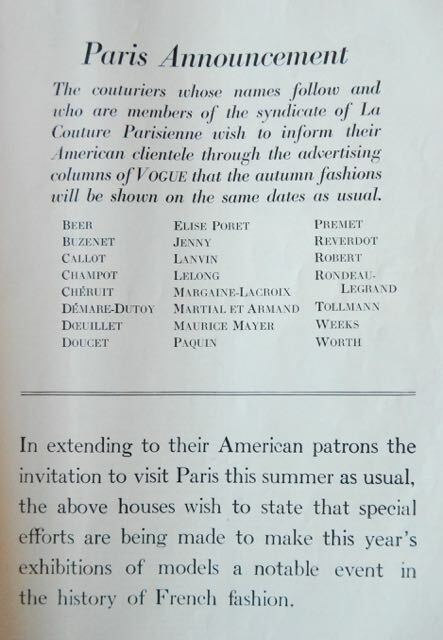 The vogue for sheer material for autumn is forecast in the costume here, from Boue. It is made of silk mousseline and taffeta in a dark shade of brown which promises to be smart. 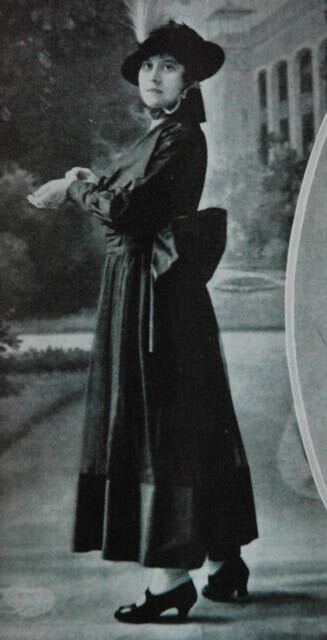 The long sleeves, high neck, taffeta hem and bow give the gown substance. 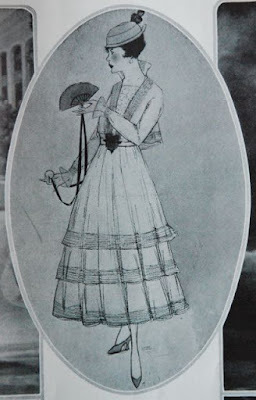 In these pictures may be seen the back and front views of a hand-embroidered white silk mousseline frock sponsored by Maurice Mayer and boasting distinctly novel features in the double collar, the odd sleeve ruffles and the corded skirt opening over a profusely ruffled underskirt. Possessed of the indefinable quality of effectiveness is a Rondeau model of black Chantilly lace over black taffeta, which is girdled with Nattier blue satin. High neck and long sleeves make the gown very smart and the gold strings dropping at the side provide a telling touch. 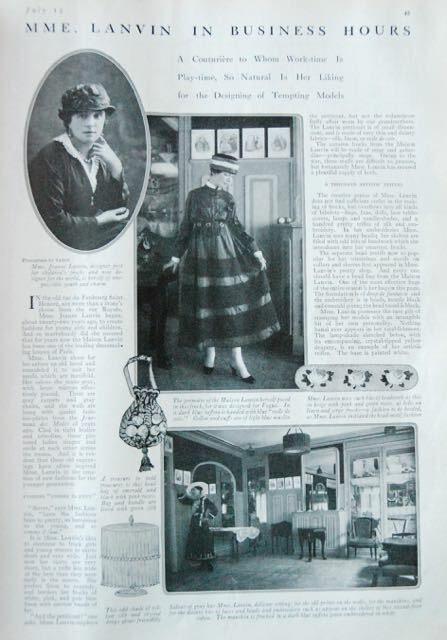 Today, I have some images for you from an issue of American Vogue from a hundred years ago. 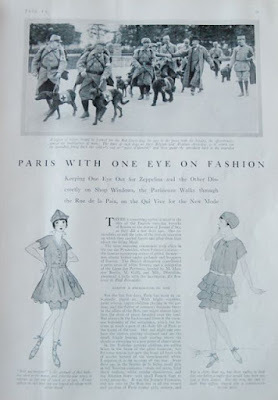 One thing which stood out was how much focus there was on French fashion, despite the war. The rest of it is normal fashion news though. and dresses from various Parisian designers. I'm having another go at making a 1930's dress... 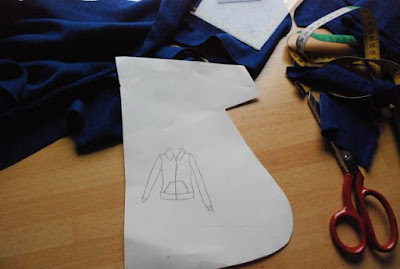 The previous two attempts didn't (really) work out (the first one was a huge shapeless sack with tiny holes for the neck and arms and the second one became more or less wearable after a lot of tinkering) and even the blouse I tried first was less than a complete success. On the one hand, I'm starting to think the styles of this decade are just not for me. On the other hand, I don't think I have a crazy kind of shape, my bust and hip measurement even belong to roughly the same size on the 1930's Gracieuse sizing chart, so there seems to be no reason why I could not make it work. Maybe I am just too used to the 1950's aesthetic. Anyway, last weekend, I had another look at the options I put on my Pinterest board. 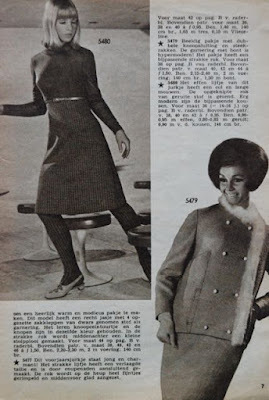 I didn't just look at the pretty pictures on my computer, no, I looked them all up in their magazines and had a look at the pattern pieces. I have noticed before that some illustrations which look really complicated and interesting actually have very ordinary patterns. And sometimes, it's the other way round. Studying the patterns and considering the time of year limited the number of options considerably. 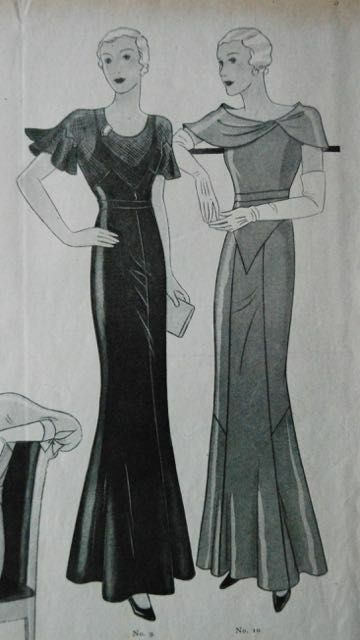 The one on the left, an evening dress from October 1933. This is one of only two designs on my board which is (partly) cut on the bias. 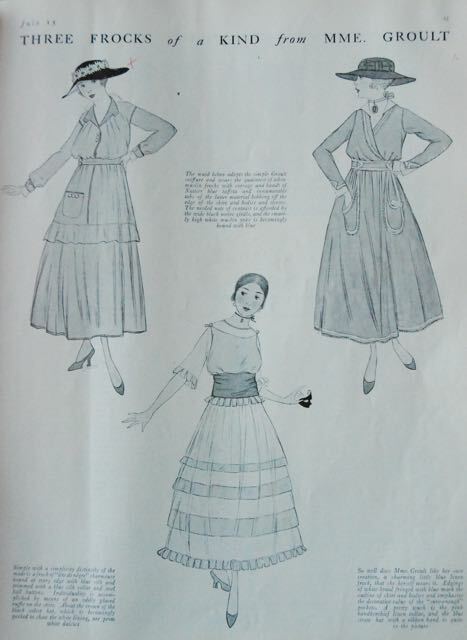 Every time I've talked about 1930's dresses here, I get comments about how 1930's dresses should be cut on the bias. 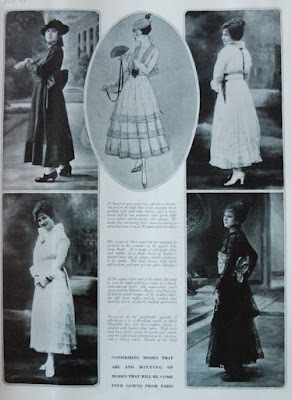 Now, I'm sure this was true for those sleek show-stopping dresses worn by Hollywood starlets but it certainly wasn't true for what normal women wore every day. It makes sense really, who would want to use the most fabric-hungry style of cutting in a time of serious economic crisis? 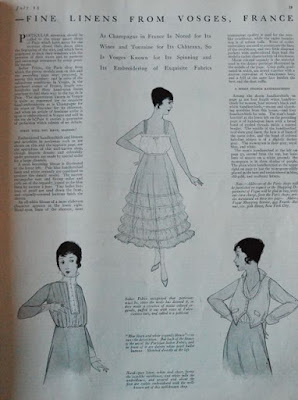 Based on my original patterns, I would say bias cut was very rare (to non-existent) in designs for normal people until 1933. From that year, it shows up occasionally. 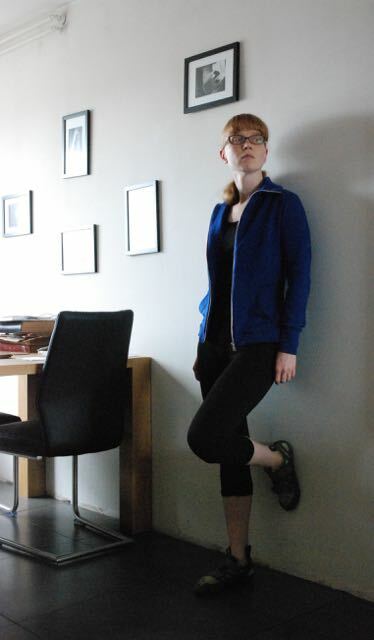 Usually in skirts and most of the time for evening wear. 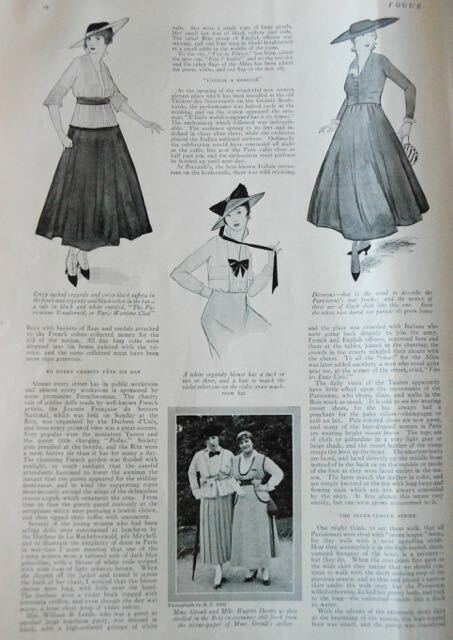 In this design those skirt pieces, which start in points above the waist, are cut on the bias. 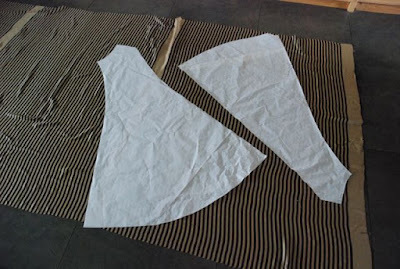 the short bodice and flutter sleeves are supposed to be made from a double layer of tule. To preserve the 82-year-old pattern sheet, I'm tracing the pattern this way. It is tricky but it works. The fabric I'm using is this very soft cotton with beige and black stripes. I have close to four meters of it but unfortunately, it has these wide beige stripes at every meter or so. If I had had four 'panels' of stripes, I would have used those and cut without those wide stripes but I don't. I have no other choice than to try and incorporate them into the look. I'm trying to match the stripes at center front and back. I'll have to see about the sideseams. The bodice will be black tule. I'll start sewing tomorrow. Hopefully, it will be third time lucky!